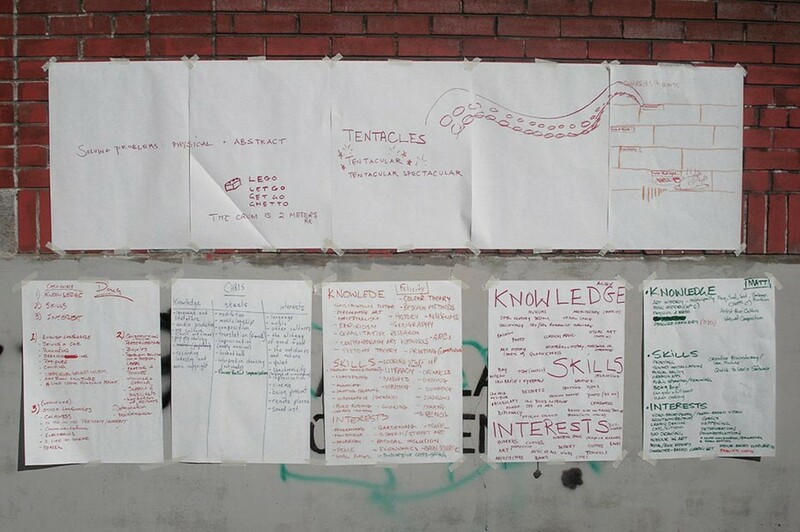 CRUM, Skills, Knowledge and Interests Pulled Together During a Corporate Retreat, 2008. Courtesy of the artists. Making It Work explores the idea of collaborative process and how it manifests itself uniquely within collectives. The collectives involved were invited to self-reflexively examine their collaborative process and, in whatever way best suits their practice, present that process in the gallery. Essentially, this project turns the regular exhibition premise inside out and features process, rather than final results, as the main focus of the exhibition. The collectives participating in Making It Work are all local, more or less, to Montréal. Making It Work is very much a multi-faceted exercise rather than a traditional exhibition. The decision of how to represent their process was left up to the collectives themselves, aware that by doing so, the assignment would be very introspective and for some, difficult. It is also interesting to see how the collectives, who have existed side-by-side in the Montréal art scene, respond to being brought together to share their inner workings “officially” under one roof. The manner in which individual subjectivities come together to form another unique single identity is transformative, creative, dynamic and multifaceted. Artists working together develop a collective imaginary, another entity. This process varies from collective to collective: within the collectives involved in Making It Work, there is diversity in structure, location, as well as chosen media and approach and these factors all impact the creative process in one way or another. But in spite (or because) of these complex interpersonal dynamics, collectives are able to produce work which none of the members would necessarily be able to make on their own. There is a shared roster of skills, experiences, references, personalities and energy that together can take projects to ambitious and unexpected places. Collaboration can provide an extra level of confidence, thoroughness and, conversely, a level of spontaneity that a lone artist might not allow him or herself. In this sense, collectives function as heterotopian bubbles – invented communal spaces of both engagement and retreat. The process of being in a collective is sometimes where the most interesting work arises. Indeed, by combining their strengths collectives are in their own way making it work. Making It Work is presented in conjunction with the OFF BNL MTL. The Leonard & Bina Ellen Art Gallery‘s contemporary exhibition program is supported by the Canada Council for the Arts.